Ravnica’s vast, worldwide cityscape is a patchwork of grand halls, decrepit slums, and ancient ruins, with layer upon layer of stonework—and guild maneuverings. Of the world’s countless civic centers, one looms large above all others: the City of Ravnica, a metropolis so vast that its name has long since become synonymous with the entire plane. 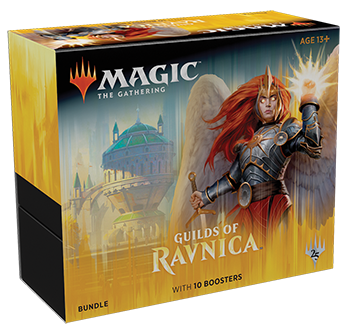 It is here, amid the mazes of streets and towering Gothic spires, that Ravnica’s guilds vie for power. Each of the ten guilds has mastered two of the five colors of mana, resulting in dramatically different cultural identities and functions. The military guild of Boros (red-white) believes righteousness is fire, shining with the light of justice. The dragon-led Izzet (blue-red) fuses elemental magic and technology, making its members the undisputed masters of innovation. The exclusive members of Selesnya (green-white) honor selflessness, nurturing, and spiritual congregation—while outsiders see them as brainwashed nature cultists. The death-worshiping Golgari guild (black-green) controls a vast undead army and labor force in the city’s underbelly. Secretive House Dimir (blue-black) fuels ghost stories of necromancer advisors, phantasmal assassins, and black horrors slithering in the sewers. Orzhov (white-black) is a rigid hierarchy of pomp and ritual, slaves to deals and coin. Gruul (red-green) is the guild of beggars, gangs, and raiding parties, all driven by base urges and instinct. The Azorius Senate (white-blue) are the primary lawmakers on Ravnica, in contrast to the demon-led Rakdos (black-red), who delight in thrill-killing and pleasure-seeking. Amid all this politics and chaos, the researchers of the Simic Combine (green-blue) work industriously to maintain nature, even modifying it to survive. The power of each guild had been kept in check by an ancient agreement known as the Guildpact. But as this agreement dissolves, conflict once again flares. September 29th at Midnight & 4pm. JOIN US FRIDAY NIGHT AT MIDNIGHT (AFTER FNM) FOR THIS AWESOME PRE-RELEASE TOURNAMENT!